Editor’s note: I believe the postmark to be 1916. The card has a copyright date of 1915. Lena and John did not move from their farm into Connersville until the 1920s, I believe. The postcard is still addressed to the R.F.D. 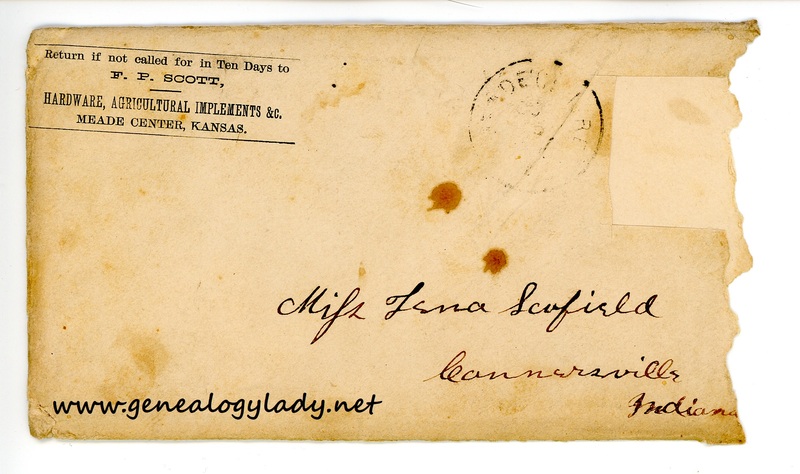 This entry was posted in Genealogy, Lena's Postcards and tagged 1916, Elizabeth E. Morris, Fayette County, genealogy, Indiana, Kansas, Lena (Scofield) Hackleman, postcard on February 19, 2018 by Deborah Sweeney. 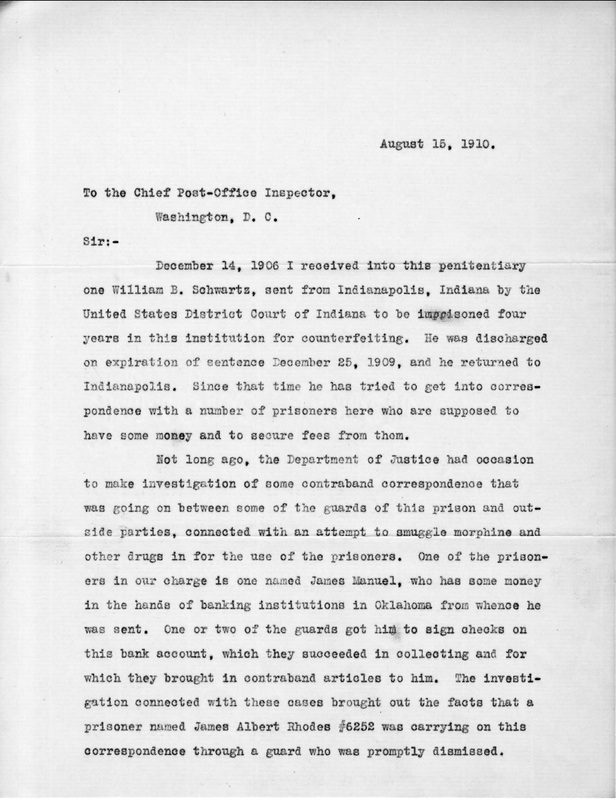 December 14, 1906 I received into this penitentiary one William B. Schwartz, sent from Indianapolis, Indiana by the United States District Court of Indiana to be imprisoned four years in this institution for counterfeiting. He was discharged on expiration of sentence December 25, 1909, and he returned to Indianapolis. Since that time he has tried to get into correspondence with a number of prisoners here who are supposed to have some money and to secure fees from them. Not long ago, the Department of Justice had occasion to make investigation of some contraband correspondence that was going on between some of the guards of this prison and outside parties, connected with an attempt to smuggle morphine and other drugs in for the use of the prisoners. One of the prisoners in our charge is one named James Manuel, who has some money in the hands of banking institutions in Oklahoma from whence he was sent. One or two of the guards got him to sign checks on this bank account, which they succeeded in collecting and for which they brought in contraband articles to him. The investigation connected with these cases brought out the facts that a prisoner named James Albert Rhodes #6252 was carrying on this correspondence through a guard who was promptly dismissed. 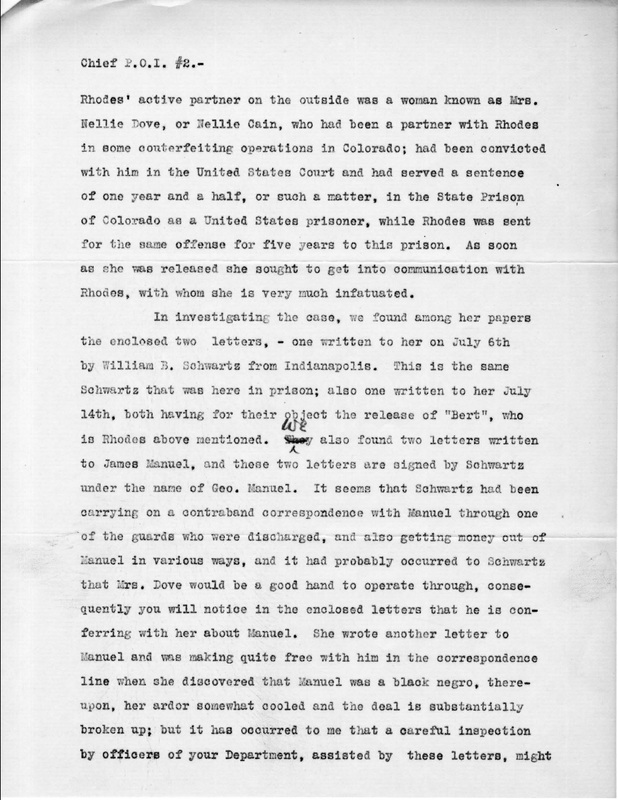 Rhodes’ active partner on the outside was a woman known as Nellie Dove, or Nellie Cain, who had been a partner with Rhodes in some counterfeiting operations in Colorado; had been convicted with him in the United States Court and had served a sentence of one year and a half, or such a matter, in the State Prison of Colorado as a United States Prisoner, while Rhodes was sent for the same offense for five years to this prison. As soon as she was released she sought to get into communication with Rhodes, with whom she is very much infatuated. show that Schwartz in using the mails for fraudulent purposes, and put a stop to his career in that line, as it seems one penitentiary sentence has not been sufficient to cure him. I submit them therefore for your consideration, asking that if you do not find anything in the matter worthy of further investigation, that you will return these letters to me as I wish to keep them in the files for possible future use. There is no doubt that Schwartz is a thorough paced scoundrel and will be using every opportunity to practice fraud wherever it will bring him money. I will be glad to co-operate with your officers and furnish them any further evidence that we may come across in progress of the investigation which is now being made by the Department of Justice. 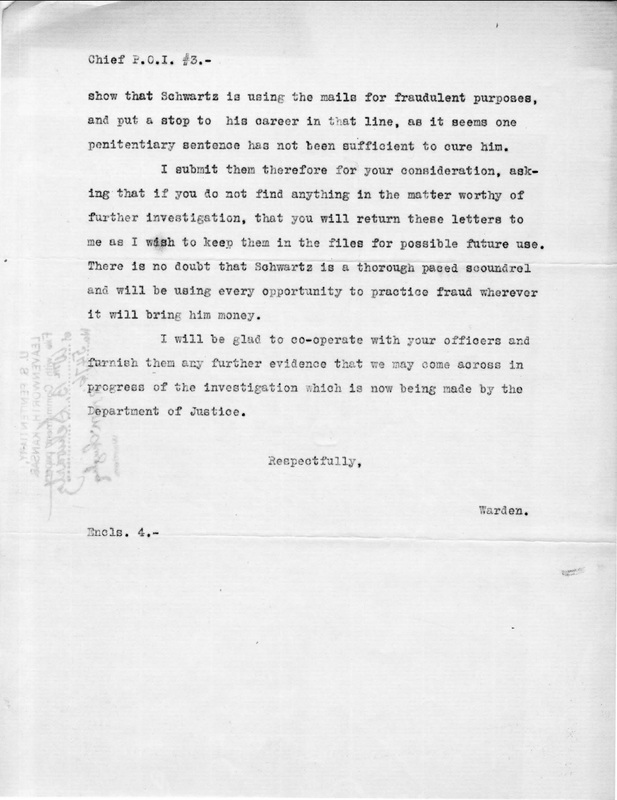 Letter from Warden R. W. McClaughry to Chief Post Office Inspector, 15 August 1910, William B. Schwartz, Prisoner no. 5476; Inmate Case Files, U. S. Penitentiary, Leavenworth, Kansas, 1895-1931, Record Group 129; National Archives at Kansas City, Missouri. This entry was posted in Genealogy, Schwartz, William B. Schwartz and tagged Chief Post Office Inspector, Fort Leavenworth, George Manuel, James Albert Rhodes, James Manuel, Kansas, mail fraud, Nellie Cain, Nellie Dove, penitentiary, R. W. McClaughry, William B. Schwartz on May 3, 2014 by Deborah Sweeney. Referring to Mr. R. V. LaDow’s letter of the 8th., inst., asking for information as to how William B. Schwartz, #5476, was discharged on Dec. 25th., 1909, instead of Jan. 9th., or later, I have to say that I find in figuring the date of sentence the clerk at the time took the date the Commitment was certified to (Dec. 11, 1906) instead of the date of the sentence Nov. 27th., 1906. The mistake was discovered and corrected but evidently no corrected card was sent to the Superintendent of Prisons. 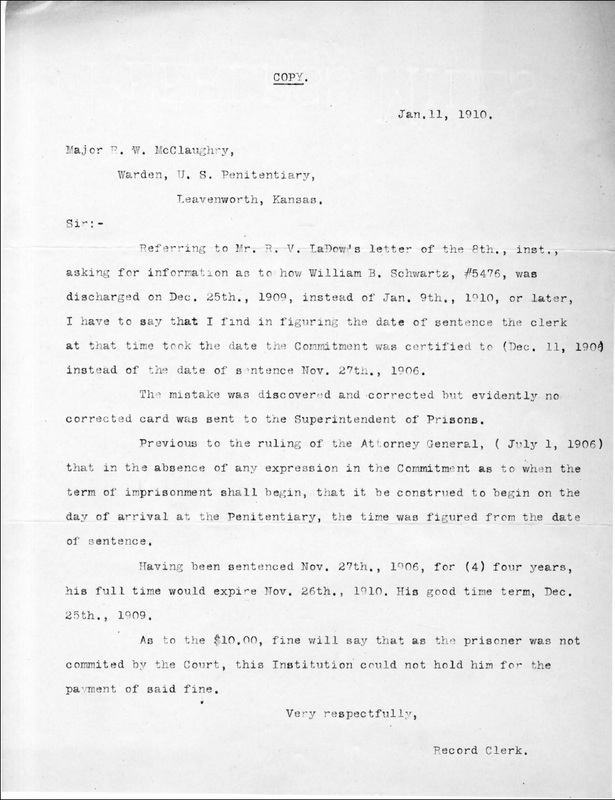 Previous to the ruling of the Attorney General, (July 1, 1906) that in the absence of any expression in the Commitment as to when the term of imprisonment shall begin, that is be construed to begin on the day of arrival at the Penitentiary, the time as figured from the date of sentence. Having been sentenced Nov. 27th., 1906 for (4) four years, his full time would expire Nov. 26th., 1910. His good time term, Dec. 25th., 1909. As to the $10.00, fine will say that as the prisoner was not commited by the Court, this Institution could not hold him for the payment of said fine. This entry was posted in Genealogy, Schwartz, William B. Schwartz and tagged Fort Leavenworth, Kansas, penitentiary, R. V. LaDow, R. W. McClaughry, William B. Schwartz on May 1, 2014 by Deborah Sweeney. 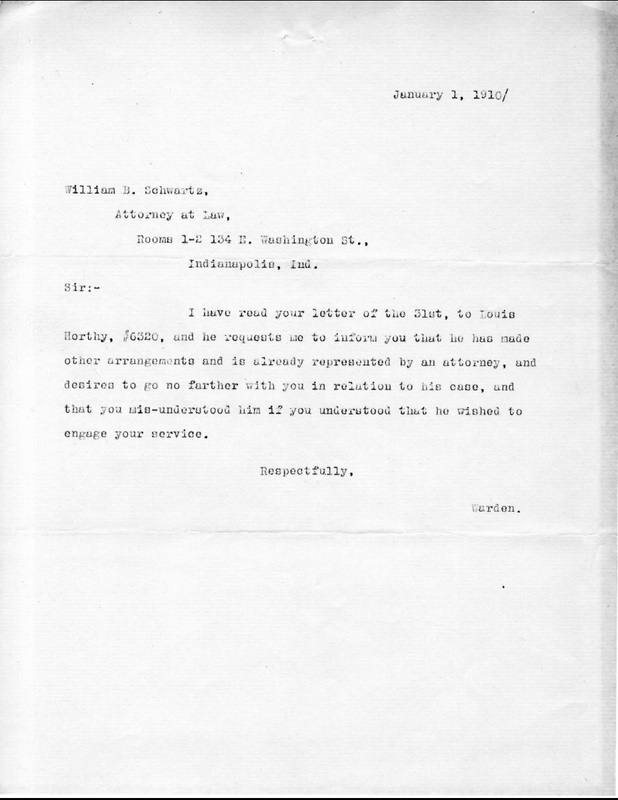 Replying to your letter of January 8, 1910, relative to the discharge of William B. Schwartz, #5476, beg to say, that I referred your letter to the Record Clerk, and enclose herewith his statement with regard to the case. I have also investigated the records and find that his statement is correct. The Record Clerk on duty at the time the prisoner was received, made the error of fixing the commencement of sentence at December 11, 1906. The mistake was evidently discovered and corrected by a future Record Clerk, but he omitted to send a corrected card to you. The short term of the prisoner expired December 25, 1909, and he was properly discharged on that date. The original card and the corrected one are also herewith enclosed for your information. 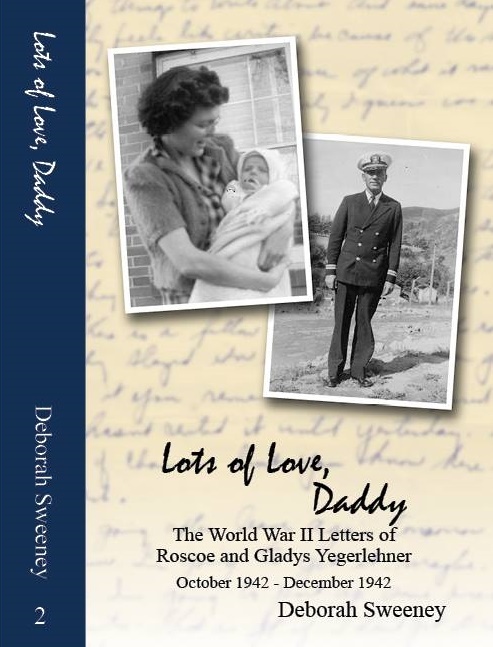 This entry was posted in Genealogy, Schwartz, William B. Schwartz and tagged Fort Leavenworth, Kansas, penitentiary, R. V. LaDow, R. W. McClaughry, William B. Schwartz on April 30, 2014 by Deborah Sweeney. In your list of prisoners discharged during the month of December 1909 appears the name of William B. Schwartz, Register No. 5476. 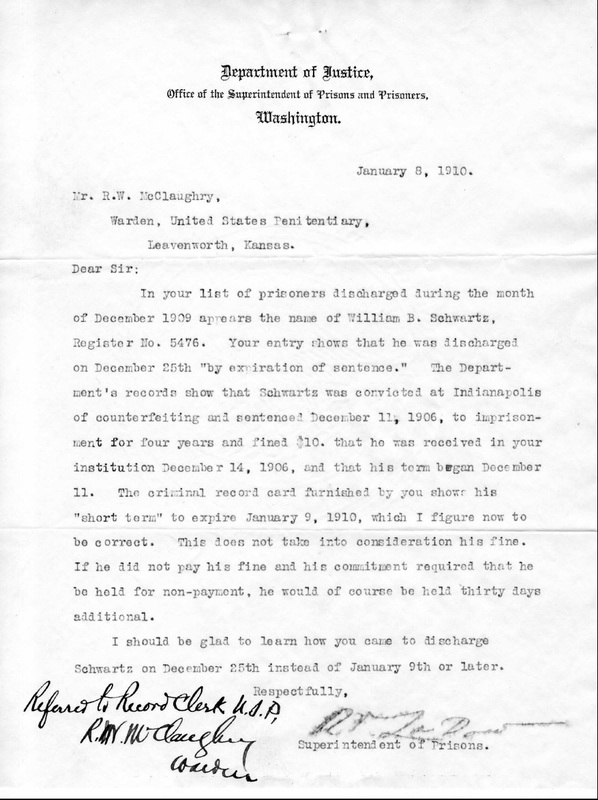 Your entry shows that he was discharged on December 25th ‘by expiration of sentence.” The Department’s records show that Schwartz was convicted at Indianapolis of counterfeiting and sentenced December 11, 1906, to imprisonment for four years and fined $10. That he was received in your institution December 14, 1906, and that his term began December 11. The original record card furnished by you shows his “short term” to expire January 9, 1910, which I figure now to be correct. This does not take into consideration his fine. If he did not pay his fine and his commitment required that he be held for non-payment, he would of course be held thirty days additional. I should be glad to learn how you came to discharge Schwartz on December 25th instead of January 9th or later. Referred to Record Clerk U.S.P. 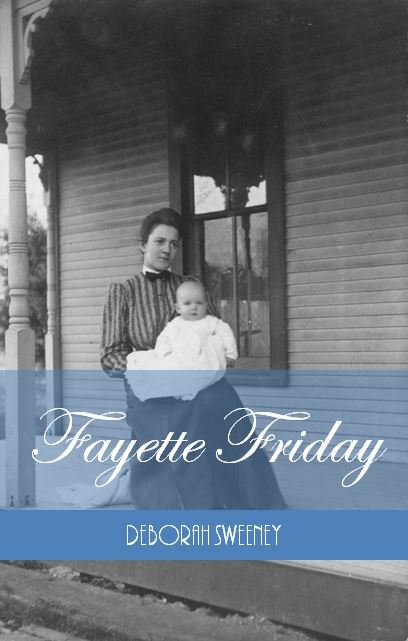 This book has information on Robert W. McClaughry and his methods while he was Warden at Leavenworth. R. V. LaDow was the first Superintendent of Prisons. He served from 1908-1915. Letters and correspondence between LaDow and McClaughry can be found at the National Archives. This entry was posted in Genealogy, Schwartz, William B. Schwartz and tagged Fort Leavenworth, Kansas, penitentiary, R. V. LaDow, R. W. McClaughry, William B. Schwartz on April 29, 2014 by Deborah Sweeney. I have read your letter of the 31st, to Louis Horthy, #6320, and he requests me to inform you that he has made other arrangements and is already represented by an attorney, and desires to go no farther with you in relation to his case, and that you mis-understood him if you understood that he wished to engage your service. 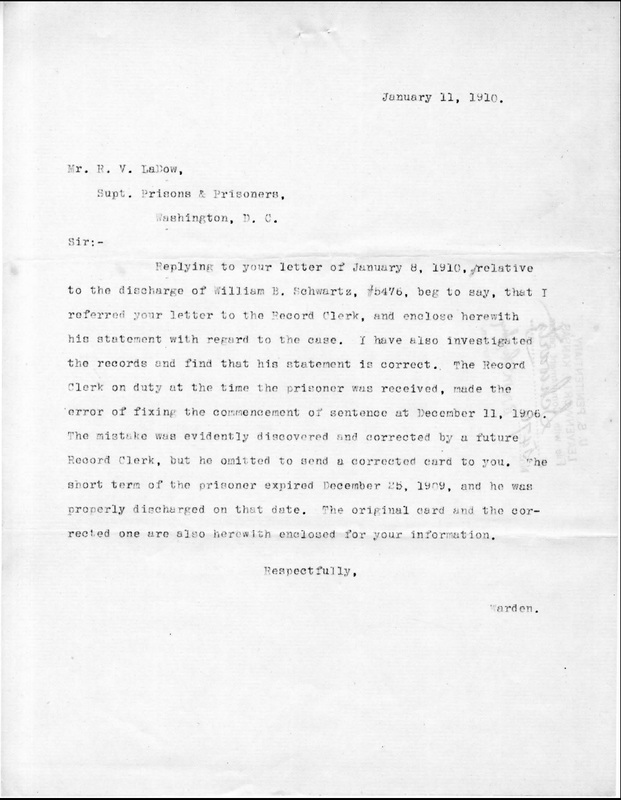 Letter from the Warden on behalf of Louis Horthy, 1 January 1910, William B. Schwartz, Prisoner no. 5476; Inmate Case Files, U. S. Penitentiary, Leavenworth, Kansas, 1895-1931, Record Group 129; National Archives at Kansas City, Missouri. 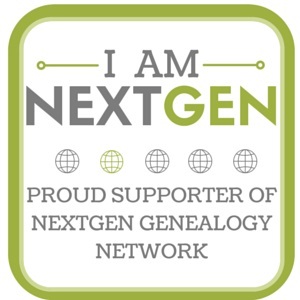 This entry was posted in Genealogy, Schwartz, William B. Schwartz and tagged Attorney, Fort Leavenworth, Indiana, Indianapolis, Kansas, Louis Horthy, William B. Schwartz on April 28, 2014 by Deborah Sweeney.